Through some “hiccup” in the divine order of the universe I’ve been invited to participate on a “media relations” panel at an upcoming conference, ostensibly tasked with delving into the miasma of eroding consumer confidence and trust in our industry. At least that’s my take on the service duty unbidden laid at my feet. The meeting is predominantly LTCI-centric, though I think the disconnect with the not-yet-buying public regarding stand-alone LTCI is fairly well understood within our industry as evidenced by the morose wailings of the masses (perhaps a misleading term?) of LTCI specialists in the producer and wholesaler ranks defending current products against the pricing sins of the past—albeit more or less innocently perpetrated due to miscalculations of future morbidity—and the occasionally cantankerous rantings of a certain beloved Broker World columnist asserting that, with now 20+ years of empirical claims data, today’s sales of LTCI are much less likely to force policyholders into pet stores for meal planning due to unspeakably large rate increases. The basilisk in the room being the unknown of future advances in medical science that might prolong lives still in need of care to, at present, unfathomable duration. And that doesn’t even address the issue of Ted Williams’ frozen head. What do “we all” “know” about public disdain for LTCI? That many think it unnecessary because The Government (Sound the Trumpets!) will take care of them? Or that it’s extremely unlikely that the need for long term care would be unfairly foisted upon them due to their righteous position as the true center of the universe? And for consumers who had actually whimsically considered it, that “use it or lose it” is particularly and perhaps uniquely immoral in the case of LTCI (versus their homeowners and automobile coverage)? And that the ubiquitous “they” all had their premiums steadily increase by leaps and bounds until at some point fixed incomes forced them to abandon their coverage altogether in their ordained years of potential need? Add to the above our industry’s failings of the past and the present: “Back in the day” truly well-meaning sellers intimated or outright advocated that lifetime benefit and the maximum inflation protection available were the vastly preferred if not logically mandated course of action if at all fiscally possible. 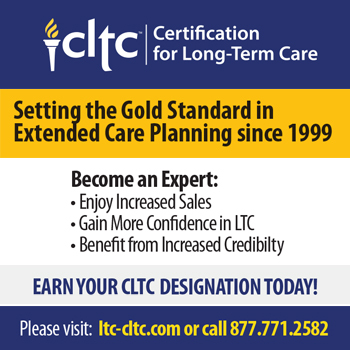 And perhaps most eligible for our self-flagellation—a large percentage of potential buyers had never been asked about purchasing LTCI. Why? Why is that still accurate today, when the vast majority of people have had either direct exposure to the long term care need within their own families or are intimately aware of the struggles of someone else dear to them? Was it that evolving product pricing for insisted upon maximum duration/maximum inflation protection continued to polarize the realm of logical prospects? Was it (is it) the fear that tightened underwriting might yield declines that might damage relationships that, to that point, had basked in the very real glow of a mutually beneficial planning partnership? And speaking of Partnership, had our own hubris regarding optimal coverage misdirected well-intentioned legislators inclined to pursue an industry-involved solution to help mitigate the long term care risk within their states until the very solution intended to help those not at the pinnacle of affluence became, of necessity, expensive enough that state Partnership Plan purveyors became perversely akin to the Maytag repairman? There is a crisis looming. The Boomer bubble faces a predicted acute shortage of licensed service staff to meet the need, and the logical assumption is that private-payor clients are most likely to receive a better quality of care. Our industry’s inability to attract new talent en masse to bolster an aging insurance sales force, combined with the reluctance of seasoned planning professionals to advocate LTCI to address the very real possibility of clients needing long term care services in the not-distant-enough future, needs to be more than merely lamentable, as it extrapolates to a drastic increase in the underserved even if we are astute enough to come up with more widely affordable LTCI products. Our industry’s “ideal” solutions for mitigating this long term care risk have become increasingly untenable for many except those paradoxically most likely to be able to financially absorb self-insuring the risk. The truth is that the first and foremost goal of long term care planning needs to be maintaining private-payor status in the case of facility care for as long as possible, and with as little impact as possible on both the estate of the patient and the pocketbooks of the adult children. Another truth is that the vast majority of LTCI claims are between two and four years, and that, when price is an issue, having something, anything, in place supersedes inflation protection. Another regrettable fact is that there are countless families the industry passed by who are struggling with home and facility care choices without LTCI today, when it’s too late to obtain coverage, and, if you can dedicate time to finding them and helping them maximize assets for the purpose of providing care, not only will you do them a great service but you should find a willing pool of prospects who not only can likely qualify for LTCI but will have motivation to buy. In the national media today there aren’t enough “Attaboys” in recorded history to drown out a single gleefully trumpeted, audience grabbing, class warfare cuddling “Oh S***” when it involves the insurance industry. Apparently the relief experienced by (and to their peers willingly related through word of mouth) a bereaved spouse or, in this case, a reluctant but relieved adult child whose facility-bound parent had purchased LTCI and its attendant impact on quality of care, isn’t en vogue with the Kardashians and thus is almost universally ignored despite it’s unmistakable poingancy. Awkward segue back to my interpreted purpose for the panel discussion…What can the LTCI industry (and the industry as a whole) do to combat media bias against our products, purveyors and practices? Increase the audience of the right-minded. Among the electorate of bereaved spouses, increase the number of those who’ve felt the lessening of their burden via the timely-delivered insurance beneficiary check. Increase the number of at-home, related caregivers whose burdens are lessened by outside consummate professionals regularly attending to the needs of the afflicted and granting time for other household duties, errands, or simply the opportunity to take a guilt-free deep breath. Among those visiting loved ones in care facilities, increase the number who can at least be somewhat assured that they were able to place their parent in a better than average “new normal” with empathetic, energetic and well equipped staff. Until carriers modify their national messages, as some have, back to the “insurance companies are here to help all” messages, there is little our industry can do via commercial appeals to effect change—at least in Prime Time. But, in my town, local news outlets are both much more affordable and much more likely to embrace a positive message about the services you are able to offer. I’ve even seen good friend Chris Carothers on local Vegas news segments. Whether it be life insurance or LTCI, one by one, voice by voice, keystroke by keystroke, hashtag by hashtag, peer group by peer group, Facebook friend group by Facebook friend group, handshake with cheap-suit-wearing news anchor to handshake with cheap-suit-wearing news anchor, we need to strive to bloom a public perception that can hopefully one day reduce the national media naysayers to the point where they are either desperately clinging to a Springer-like pandering to those stubbornly devoted to ignorance or choose to morph their approach into honestly and earnestly trying to help the people they reach.